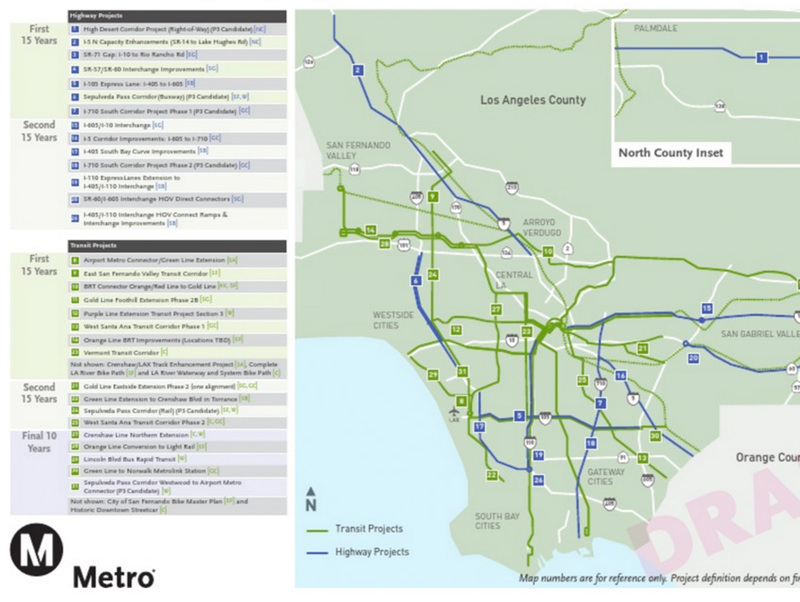 Metro announced its plans today for massive investments in rail, bus, bike, pedestrian, and freeway improvements, to be funded with an extension of the current Measure R ballot tax from 2008, as well as a new tax bump. Voters will be asked to approve the proposal in November, and two-thirds of the electorate needs to sign on to make the plan a reality. –Toll lane and new bus service to the 405, with future plans for an underground rail line between the Orange Line Van Nuys station and the future Wilshire/Westwood Purple Line station. Obviously, the toll line could happen a lot sooner and Metro believes they can restripe the current HOV lane and turn it into two toll lanes, aka Express Lanes, in each direction. –The planned extension of the Purple Line to Westwood built a decade quicker, meaning we’ll be traveling from DTLA to UCLA in less than a decade. –Airport Metro Connector on the under-construction Crenshaw Line. This is a must-do item if people ever hope of taking the train to LAX. This station would connect to the people mover that LAX is building, and would include restrooms, wifi, and a kiss-and-ride area. –Grade separation for parts of the Orange Line bus rapid transit line, so it moves faster from NoHo to Chatsworth. Eventual plans could convert the Orange Line to light rail. –A completion of the L.A. River bike path all the way from DTLA to the western portion of the Valley. –Adding two zero emission truck lanes in each direction to the 710 from the ports to Commerce. –Express Lanes on the 105 through South L.A., from the 405 to the 605. Again, the HOV lane would be restriped to create two Express Lanes in each direction for 16 miles. –An extension of the Gold Line from Azusa to Claremont—while some may think it odd to extend the train line this far east, the project is nearly shovel-ready and the recently-opened Gold Line opened to huge numbers this month. There are other exciting and worthy proposals for the project—namely a north-south rail line connecting LAX to Hollywood via WeHo, building out another rail line connecting the Valley to LAX, and finally extending the Green Line to the Norwalk Metrolink commuter rail station—but those are decades out and we’re still trying to get through this election year.